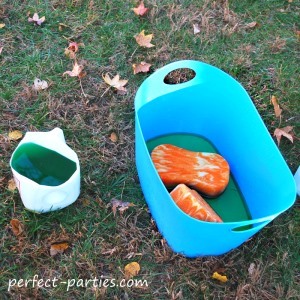 A fun theme perfect for all ages. 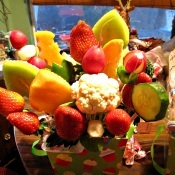 It can be tailored to be an Olympics theme or a Game party theme. If you use red, white and blue as your theme colors it could be a Fourth of July or Patriotic theme as well. Most of these games can be done indoor if necessary but it would be a great way to keep kids busy outdoors. Cookie medals for all to wear and eat! Here is the recipe used from Martha Stewart or we have our own Sugar Cookie Recipe that we have made Cookie Lollipops with great success. Scroll down our page for the Royal Icing Recipe that we used to create vibrant colors. You can find solid color Plates, Bowls, Cups, Napkins and Cutlery at Celebrate Express , WalMart or The Dollar Tree. Be sure to give time to reply. Also, if you require the children to bring or wear a specific type of clothing such as socks, be sure to notate it on the invitation. Be sure to specify if you want parents to stay and help supervise or if they may leave. For younger children, you may want at least one parent to help monitor the children. Set up a table with colorful napkins and plates. 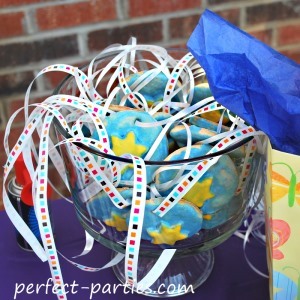 Add some balloons and a bowl of medal cookies! Make signs for the games. If it is an Olympic Party theme, use the names of various events held at the olympics...we have suggested a few. Celebrate Express has some wonderful decorations that you can find by theme. Click the button to see some! Make your own goodie bags. 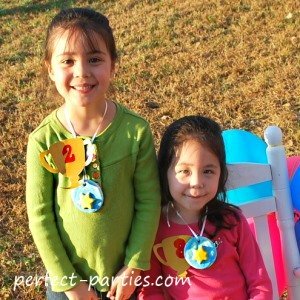 This is another area that you can personalize with the theme that your child wants. If you choose Olympic Party as your theme...focus on Healthy Foods with fresh fruit and veggies or easy with items like Pizza. Have sponge soaking in large bucket of water. Estimate the amount of water that you think you can squeeze out of the sponge...one squeeze only! Using a board and some bricks you can make a simple low balance beam. Estimate if you can walk without falling off of the balance beam. 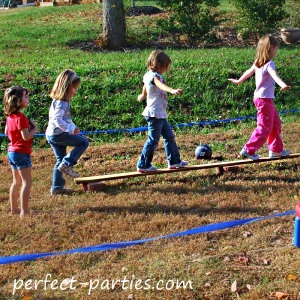 Discuss what is the safe way to walk on the beam...no running, space between each child, waiting until the person in front of you is a few steps ahead. 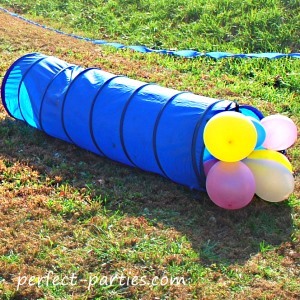 Using tubes or boxes, make a simple obstacle course for children to crawl through. You can find this type of crawl tubes at stores like Ikea. Again a few words of safety such as one child at a time and how you crawl through the tube is helpful. Estimate the distance in inches or feet that you think you can throw the "javelin" straw. Use any type of straw as your Javelin. Some stores have Jumbo straws that would be easier to handle. Mark where children stand to throw and measure. 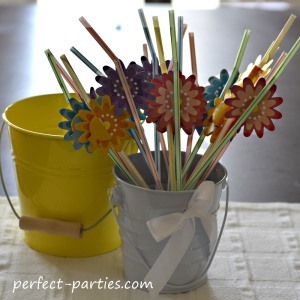 To make the game longer have each child throw 3 straws and take the longest distance. Estimate the distance in inches or feet that you think you can throw the paper plate "discus" or use a mini Frisbee if you really want a challenge. Use a paper plate for safest discus. With older children you might try a plastic plate or mini frisbee if you can monitor for safety. To make the game longer have each child have 2-3 tries and take the longest distance. 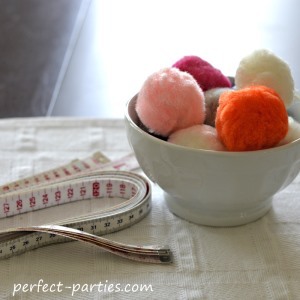 Use cotton balls, pom poms or whiffle balls. Other ideas might be a tennis or ping pong ball but you will need a runner and someone willing to measure farther distances. Mark where children stand to throw and measure. If you are using a ball that can go a longer distance, pre measure yards and take measurement from the closest marker. To make the game longer have each child throw twice and take the longest distance. Estimate the number of marbles you can grab in one hand. Use marbles, counters, or other small objects. Place in a bowl for easy grabbing. 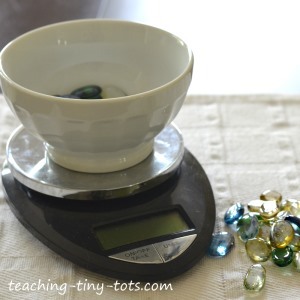 Count the number of marbles grabbed or place in a bowl and weigh. Select game items to match the color theme as well as the cookie medals. Remember to take caution if there are very young children attending and either select games age appropriate or have an adult monitoring games like the Marble Grab. If you have any Olympic Party suggestions...please share below in our comment box!